I don’t know about you, but I enjoy my lunch every single day, and treasure the time taken off, away from the hustle and bustle of the cubicle in order to enjoy a pleasant personal time – just me and my lunch. 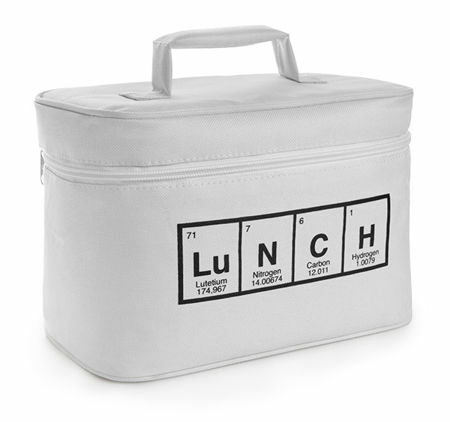 Well, for those who enjoy lunch periodically, you might want to go a little bit nuts with the $14.99 Periodic Lunch Bag, where it comes in the form of an insulated lunch bag with reflective inner lining that has “LuNCH” emblazoned in front, except that they are in periodic elements. This is definitely a lunch bag meant for chemistry fans , that’s for sure!